The Amended BEE Codes provides for businesses with turnover up to R10m to be EMEs. If you are an EME or black owned QSE you now only need an Affidavit to confirm your business' annual turnover and black ownership status. 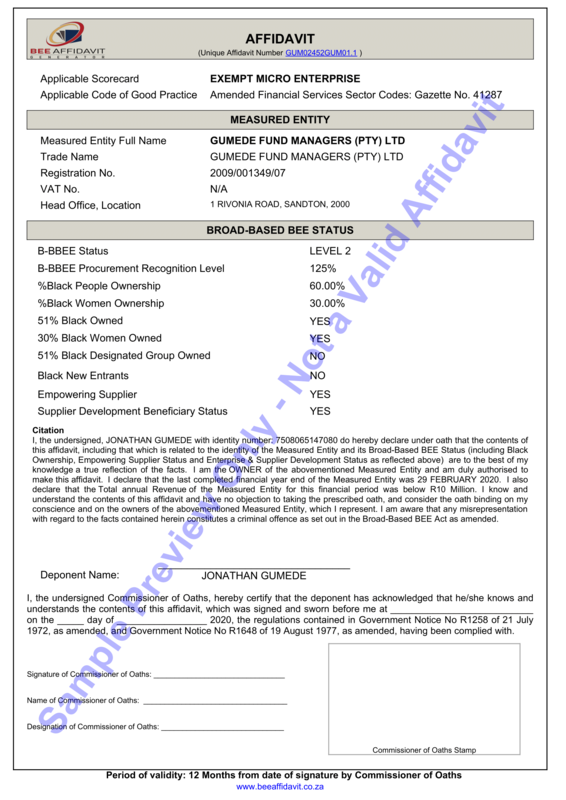 Compiling an Affidavit for BEE purposes is however not always as straightforward as it seems and carries the risk that the deponent inadvertently makes him/herself guilty of misrepresentation by attesting to certain terms with which he/she may not be familiar, for example 51% Black Owned status, Designated Group status, Empowering Supplier status etc. Our process limits the risk of inadvertent misrepresentation of your BEE status by guiding the deponent through easy to understand questions. At the end of this easy process you will then be able to download and print your Affidavit, which must then be signed by a Commissioner of Oaths. The Amended Codes became binding on all businesses not governed by a sectoral code on 1 May 2015, while the sectoral codes were allowed a further 6 months transition until the end of October 2015 to align with the general Amended Codes. Although the Amended Codes expressly allows businesses to elect to opt into it during a transition phase, the entire market - private, parastatal and government departments - might not readily accept these affidavits from entities still governed by an old sector code. 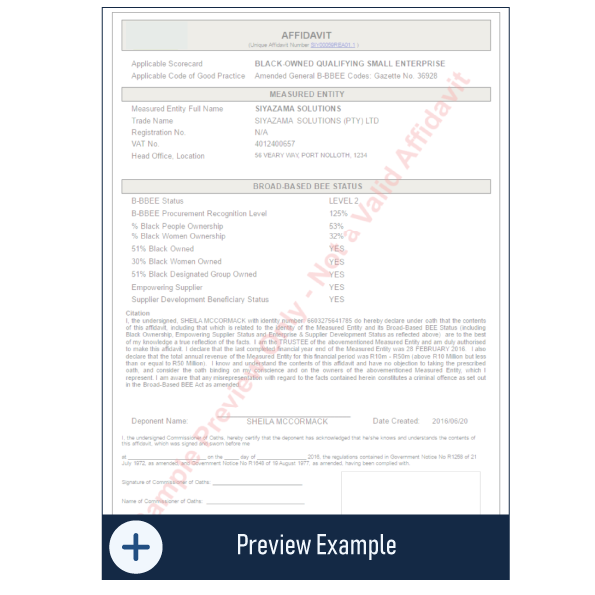 Therefore, be sure to check with the intended recipient of the affidavit (your client or the tender board you are tendering with) - whether they accept affidavits in terms of the Amended Codes - prior to continuing with this process. Click here to view the directive by Treasury sent to all organs of state and public entities requiring them to accept Affidavits instead of certificates for EMEs and Black-Owned QSEs.